Last week Animatsu was officially launched in the UK, the new anime distributor from former Manga employees Jerome Mazandarani and Andrew Hewson. Here’s the link to the news article, which also details their first licenses in the UK. And today, with the publication of Neo and MyM imminent, Animatsu’s next licence is revealed as Gatchaman Crowds. Update: The other license has been revealed today as Akame ga Kill. Although probably not for Ghibli anime The Tale of Princess Kaguya from director Isao Takahata, which was nominated this year alongside the usual US animated suspects. In fact the biggest news was the absence of the Lego movie from the list, which many considered a shoe-in. But while there is always the feeling that the anime nomination is usually just there to make up the numbers, in an awards ceremony that is increasingly criticised for its lack of diversity, an Oscar nomination does at least mean that extra bit of promotion for the film. Following its nod, The Tale of Princess Kaguya will now get UK cinema distribution from March 20th. We don’t often talk about the printed stuff here, opting to focus on the moving image, but this week Crunchyroll made a move that will be sure to please manga fans as well as the anime fans. The last year or so, they’ve been expanding their focus on digital manga, offering translated chapters of popular manga online, not too far behind their Japanese release. Previously, this required a separate subscription, but as of now, access to manga content will be part of the premium membership package. Now you get your manga along with your anime for one convenient and cheaper price. We’ve known for some time now that the Fairy Tail Collections, which gathered the individual parts together were going to be DVD only from Collection 3 onwards. When they made that announcement, Manga Entertainment assured fans that the individual part releases, (Part 9 is due for release in February) would be available on Blu-ray as normal. Suspicions were raised when a DVD listing only appeared on retail websites, but it was just last week, when Manga finally replied to a direct question on Twitter that it was confirmed. Fairy Tail going forward will only be available in the UK on DVD. If you’ve been collecting the show on Blu-ray, I can fully guess what you are feeling. All I can say is that the US release from Funimation is Region B compatible for Parts 9 and 10, Parts 11 onwards, you’ll have to look to Australia for your HD Fairy Tail fix. Samurai Bride is in a similar position. Manga Entertainment announced it as BD and DVD, but only DVD listings have appeared (Amazon still have a BD scheduled from Manga for a cold day in hell). Manga Entertainment haven’t commented, replied, confirmed or communicated about this, but sod it. We all know it isn’t coming! Three reviews for you last week, beginning with Battle Girls: Time Paradox. This one got off to a troublesome start when it transpired that the BBFC demanded an edit for content. Don’t let that put you off though, as the show’s really a delightful comedy that sends a modern day slacker girl high school student into the past to relive the events of the Warring States Period. The twist is that the magic spell that sent her there was a little wonky, and she got sent to a parallel world with only females in, where all the major figures from history are young, attractive women. Click the review to read more. Next up it was the turn of an import title, as I looked at Funimation’s budget S.A.V.E. re-release of My Bride is a Mermaid. It’s another one of those anime titles in the vein of I Dream of Jeannie, or Bewitched, where a hapless teen male lead winds up involved with an otherworldly female, and has to face all the baggage that comes with her. In anime we’ve had an alien called Lum, a goddess called Belldandy, a robot called Chi, and now we get a Mermaid called Sun, who happens to be heir to an undersea yakuza family. And it’s not very good. Finally it was the turn of Naruto Shippuden, Boxset 20. The long running ninja epic keeps on trucking, and with this collection we get back to the main storyline after two instalments of filler. It’s still solid, anime entertainment, one of the better long running shonen action shows out there, but I could only find a trailer for the previous instalment. You’d think they’d promote these things better! 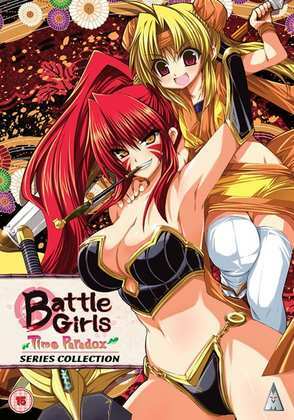 MVM’s release of Battle Girls: Time Paradox has been delayed to the 16th of February, and it’s a DVD only title. 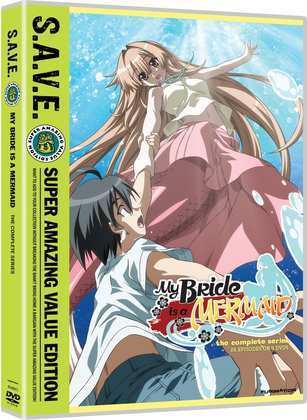 Funimation released My Bride is a Mermaid on S.A.V.E. 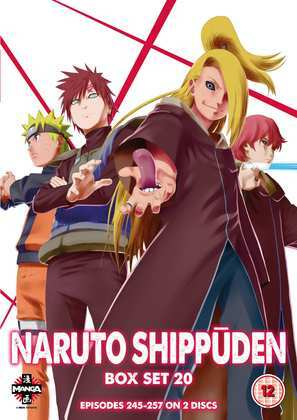 DVD way back in 2013, while Manga Entertainment release Naruto Shippuden Boxset 20 on the 26th of January.